Discussion in 'Model X: Battery & Charging' started by scottf200, Mar 3, 2016. Similar to the Model S thread: What's your 90%? Are you guys using rated or typical? I'm confused since this is a Model X thread and you mention P85D. X comes as P90D, 90D, & 70D (not out yet). See first post for Model S thread. I'm now getting 229 on a 90% charge. I am losing about 3 mi overnight to vampire drain. My 90 is 225 thus far. I leave Merlin plugged in when he's in the garage so no vampire drain overnight. I think there is still vampire drain, even if plugged in overnight. It will only draw power to top up after the charge state drops below a certain threshold below your target. So, your 90% might be 226 or 227 and dropping to 225 by the time you drive the car in the morning. My condo's electrical billing system shows real time energy consumption for each unit. And my charger in the garage is billed/tracked/monitored as a separate unit. It's clear from the usage graphs that no current is drawn after the car reads its desired charge target. If these car is left sitting plugged in for a few days, then it'll top up after a while (about once a day) at the current rate set. Then it sits idle again. So that would contradict the behavior you are quoting from the manual. When new, my P90D Model X was 225. After 3 months and 2,000 miles it is now at 223. Almost the same range as the 3 year old Model S P85 version "A" battery pack with 45,000 miles. Are these range mode on numbers? If X has range mode anyway. Picked up my Model X 90D (not P). Car was charged to 90% and the rated range was 238 miles. 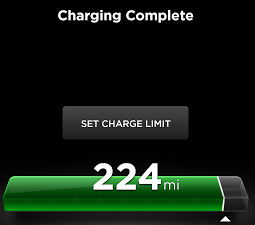 Car is currently at bra/tint installer, so can't check it, but Tesla app now says it has 234 mile range left. Car had 18 miles on the ODO when I picked it up.